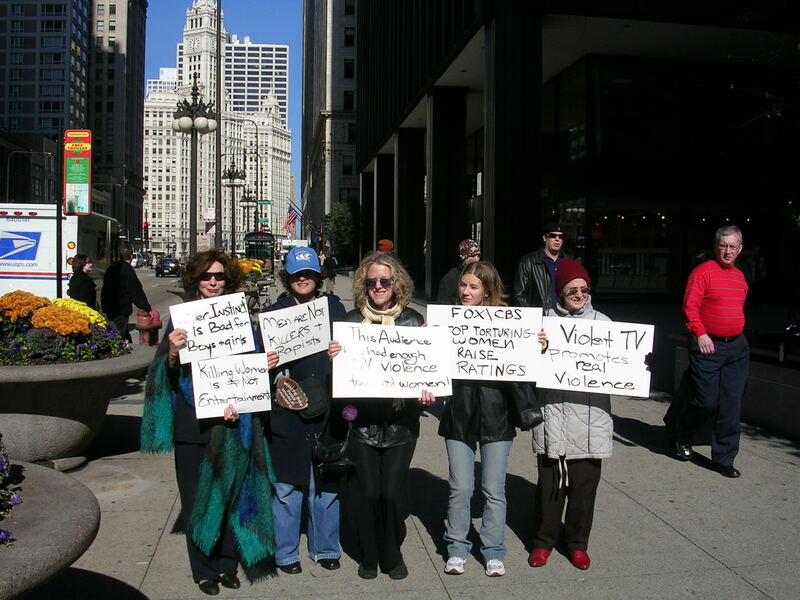 Chicago Women Speak Out Against "Entertainment Violence Against Women"
Carrying signs and chanting, "Violence against women is not entertainment,: a group of Chicago women, Women Against Violence, held vigils at WFLD-FOX and WBBM-CBS on October 28 to protest the networks' new-show lineup which Patrice M. Jones, Tribune staff reporter, described as showing "a mind-numbing variety of scenarios in which women are raped, chained, butchered and brutalized for your nightly entertainment." After the vigils the women met with representatives of station general managers to deliver letters asking the local affiliates to stop carrying these shows. In the letters the women wrote: "We ask you to do this: please close your eyes and picture this young woman and those in real life who have been the victims of such violence. How would it feel if this were a loved one~Wmother, sister, cousin, aunt, grandmother? That is who the real victims are -- our loves ones, friends, and neighbors. These shows display sadistic treatment of women as 'entertainment' which also means that men are regularly featured as rapists, torturers, and killers. This is a horrific diet of nightly slop to serve up to audiences of young men and women. There is no redeeming value to these shows other than to perpetuate violence against women. As concerned activists and parents, we not only have a right but a responsibility to ensure that the airwaves do not promote criminal activities toward women. This use of the airwaves to promote violence sabotages all the work we do as parents to protect our children by offering up vicious stereotypes of women as victims and men as brutal criminals. It helps to continue the cycle of violence. The use of the public airwaves is a privilege. Promoting and glorifying violence against women is an abuse of power." The women asked that the local affiliates join with them "in taking one step to ending violence against women by working to remove such shows from the airwaves." The women vowed to follow up with the general managers and to pressure advertisers not to support the shows.